Growing up in the wide open spaces of Maine, I went camping every summer with my kith and kin. From my childhood to adulthood, I participated in numerous camping trips and hosted some car camping trips. Throughout my journey, I got to strengthen my bond with my family members, made friends, gained precious experience, reconnected with the outdoors and looked at life through a different lens. Of course, these pleasant experiences need to be built on the basis of the Best Camping Tents. Going camping is fairly simple, extremely cheap and a lot of fun. Car camping or walk-in camping is a favorite summer pastime for many of us. Whether the campground is what attracts you or it’s just your base camp for other activities, you’re gonna need the most vital component of camping, camping tent! 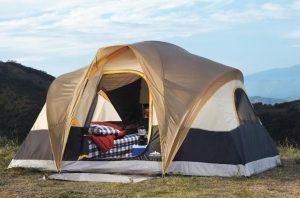 I reviewed the top 10 camping tents on the market in this article and included factors that could influence your buying decision. Reviews and tips described here, I hope, can help you find your right camping tent — your home away from home. A high-quality build from a company that has become synonymous with camping gear. This easy-to-set-up, 3-person dome tent makes it appealing for first-timers and seasoned campers alike. When I was camping in Acadia National Park, Maine, this tent consistently proved its efficiency over others. When people nearby me were hassling with their tents for set-up, I already set it up and started basking in breathtaking views the park had to offer. What distinguishes it from other 3-person tents is that its peak height. You can effortlessly stand upright changing clothes and make yourself comfortable. I love how resistant it is against the wind and heavy downpours. It nonchalantly stood up to rough storms I encountered in New Hampshire. So, quit worrying about rain. However, to prevent the odds of having a leak, I treated the seams with a sealer. The tent is highly recommended for warm weather. Its adjustable ventilation allows plenty of air inflow and reduces condensation. Gnats, and bugs and everything that slithers doesn’t stand a chance with its mesh. Pitching the tent is extremely easy. It takes only a person to assemble the tent. 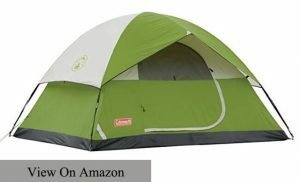 Sundome 3-Person Tent (Green & Navy Color Options) has generated over 870 reviews at 4.6 out of 5 stars on Amazon. Check them out now! The tent can shelter up to 8 people and has enough peak height to allow the tenants to stand upright. Coleman 8-Person Red Canyon Tent is luxurious, but with a price tag that is affordable to many. 2-3 couples, a group of friends can easily snuggle in it. The tent was part of my eventful camping trip with my whole family in south-central Pennsylvania. It is the cheapest tent with hefty benefits on the market. The tent is loaded with a multitude of features that will ensure that you and your family enjoy a comfortable and sound camping trip. The 72-inch center height housed my 6-foot Dutch sister-in-law well. For multiple couples, it comes with a room divider that partitions the tent up to 3 different rooms. This is a great feature as it provides enough privacy for children and adults on the same trip. Compared to its huge space, it’s easy to set up and has a fun and unique design. Its unique design is what makes it an attractive tent for family camping. Almost 2000 customers reviewed the Coleman 8-Person Red Canyon Tent on Amazon, check them out. It is a solo tent, so you can expect it to be minimal. The tent has 1 door and 1 vestibule providing extra storage. The tent is an excellent choice for a person wishing to go on a solo trip or to go light. Despite its minimalism, the tent is not less than any full-fledged featured tent. The tent has a fly made from polyester that ensures protection in almost any weather. What many seem to appreciate this tent for is its large vestibule that can house a large 65-liter pack. You can stow your bike or any extra gear and wait out the storm. The tent is surrounded by mesh, its adjacent walls, as well as parallel walls, are mesh, and it allows for ventilation. The rainfly is excellent. It is long-lasting and quality-sealed. The rainfly can be attached to each corner and has adjustable tension straps for easy and quick setup, removal and further adjustment of the rainfly. The zipper is durable, smooth and quiet. 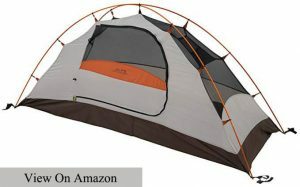 If you wish to learn more about ALPS Mountaineering Lynx 1-Person Tent, visit Amazon now. It is incredibly easy to set up this tent. The MountainSmith Morrison is a 2-person, 2-season tent that has a spacious 35 sqft of interior usable place. Space can offer extra versatility for those family outings. When my 16-year-old son and I went out to camp at White Mountain National Forest, our backpack included this tent. Rest assured, the tent will give you more bang for the buck. My son and I woke up to the sound of rain and encountered unexpected rain, but we managed to stay dry and happy. Its rainfly clips onto the main body in a breeze. 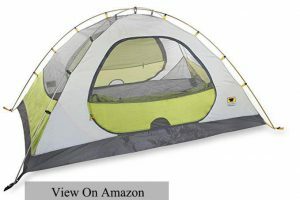 The tent offers enough ventilation with fly vents at both ends. This is really an exceptional backpacking tent with solid alum., poles, and great stakes. The poles come color-coded and can be attached to the tent using clips and grommets at the end. 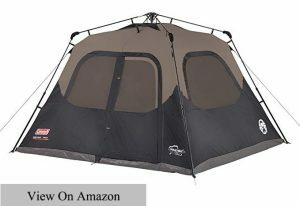 Mountainsmith Morrison 2-Person 3-Season Tent was awarded 4.5 out of 5 stars on Amazon. Check out more reviews over there. The tent comes in two models. One model caters to 6 persons and the other to 8 persons. If you purchase either of them, it just means that the tent will able to shelter 6 or 8 persons with not much room left to store your supplies or camping gear. Anyways, the tent bears Coleman’s hallmark of supplying high-quality tents at affordable prices. This tent is an excellent choice for a family tent at a feasible price. Another benefit that this tent offers is that you will able to stand upright and roam around the tent without feeling shoehorned inside. The Evanston models have a pick height of 68-74 inches. 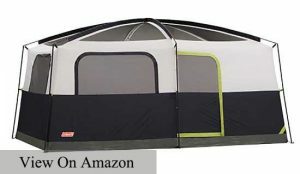 The tent features a large screened porch with a floor that efficiently wards off insects. 4 large windows can provide excellent ventilation and reduce condensation. The tent comes with an Exclusive WeatherTec System that guarantees dryness. 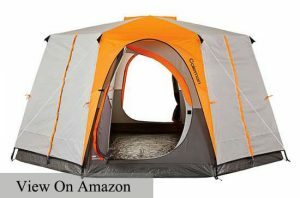 It includes a tent footprint for free, which is worth about $100. Every family member on a camping trip needs privacy, that’s why the tent’s privacy vent window allows airflow and privacy. 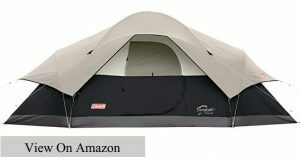 If you wish to learn more about Coleman Evanston Screened Tent, visit Amazon. This could be your ultimate family tent. You can’t but appreciate the splendor this tent has. After an arduous day of trekking and adventure, this tent could deliver serenity and pleasure and make you feel connected to the surroundings. It is one of the best camping tents for 8 person or two families. For a family looking to picnic and spend a day out in the wildness, this tent is a must. I absolutely love how light it is to carry it around. And it is spacious and provides comfort and ease of use no matter what kind of weather it is; it is pleasant, or rainy. It is dependable in the wind. Weather can get harsh and unpredictable at times. And, camping with your family, children could get drastic during harsh weather. But, Wenzel 8-Person Klondike Tent can withstand rough weather conditions. Moreover, it lets in plenty of sunshine and air while warding off bugs and mosquitoes. The tent’s base is 16ft by 11ft, so it can perfectly fit in 8 adults. It is a great deal for a camping trip for a group of friends or a big family. I recommend this tent to a couple of friends of mine. Zip-up walls can create partitions between two rooms. Its peak height is 6.5ft, as a result, tall people can roam around without bending their head. 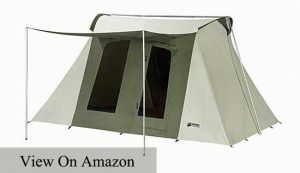 Wenzel 8-Person Klondike Tent has generated over 900 comments at 4.2 out of 5 stars on Amazon. Check them out! It is one of the best-selling camping tents manufactured by Coleman. The 6-person tent has become the first choice for many families and adventure-loving campers as they can derive much value from this affordable tent. What I like about this tent is that it manages to deliver all the affluent features that expensive tents do, but it does for an affordable price. Like all other Coleman products, it is expensive. As the name implies, this tent can accommodate 6 adults inside it. It is spacious enough that it can accommodate 2 queen sized air bags. Pre-attached poles, that come with the tent, can make the process of set-up a very easy one indeed! Unfold the tent, expand it and click some buttons, and voila! You have the entire tent ready in 60 seconds. And, Polyguard 2X fabric makes it long-lasting, durable and shields you from rain, storm and other natural hazards. The tent is easy to carry and much convenient to handle. Therefore, any novice backpacker can manage it easily. The Coleman 6-Person Instant Tent has garnered over 1200 reviews at 4.3 out of 5 stars on Amazon. Check out the reviews left by satisfied customers. It is designed exclusively for backpackers who need a tent that is compact and lightweight. MSR Hubba Hubba NX 2-Person Tent is as light and efficient as it is easy to carry. 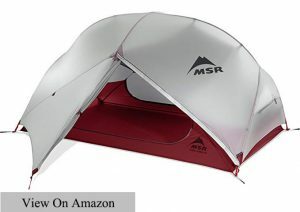 MSR recently started manufacturing camping tents that are lighter and more comfortable. It is now a competitor with the best as it shaved off a couple of pounds from their tents. Now the company produces tents with lightweight fabrics, impressive design, and mini zippers. These new additions are making customers reconsider making a purchase with MSR. Everything from its excellent ventilation, non-tapered floor to adjustable stake-out loops, this is a good all-around backpacking tent. It has two doors and its non-tapered floor maximizes space. This tent really redefines lightweight livability as it normally weighs less than 4 lbs. It offers adequate space for a lightweight tent; head and elbow room across the tent. With two large side-entry vestibules, you stow your gear. MSR Hubba Hubba NX 2-Person Tent was awarded 4.7 out of 5 stars on Amazon. Check them out now! Growing overland off-road section abounds with off-road campers. As the number of off-road increased, as did the number of off-the-ground sleeping products. But, not all these products are feasible to the average Joe and Jane. But, the product I’m reviewing here is. Napier has developed a reputation for manufacturing affordable camping tents. It has been manufacturing since 1990. It is really popular because of its easy-to-set-up the process. All you have to do is unfold the tent, lay it in place, then secure the tent’s corners, wheel wells, the bumper and tailgate to the truck. Patented sewn-in floor offers protection from the adversaries. Headroom is as high as 5 feet 5 inches. There are four windows on the top of the tent. And, an access panel in the back will help you go through items inside the truck. The tent comes with a rainfly that will protect you from natural hazards. Fortunately, I didn’t have to deal with rain since it was summertime when I camped. Even if it does, the rainfly will aptly cover the opening side and resist moisture. Napier Outdoors Backroadz Truck Tent produced over 280 reviews at 4.5 out of 5 stars on Amazon. Check the product out. If you’re looking for a tent to go out camping with your kid, then this tent is a good choice. The tent can accommodate two adults easily. Even your dog can squeeze in, leaving enough room for two adults to feel cozy. This tent is incredibly versatile. It will keep your camping expeditions convention while offering protection from stormy weather or moderate rain. The tent managed to stay snug and dry when I was caught in an overnight thunderstorm. I was camping on the shore of Lake George, NY. The tent is domed-shape, thus it can resist windy conditions if properly staked down. The rainfly does a good job at deflecting rain. The tent has enough mesh to ward off even small insects. Excellent ventilation is provided by mesh covered windows and a D-style door. The tent is lightweight and doesn’t weigh more than 8 lbs. It is easy for a person to set it up. And, it takes less than 10 minutes for set-up. 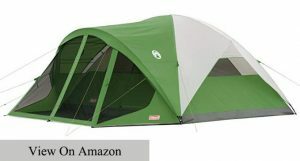 If you wish to know more about the Wenzel Alpine Tent, visit Amazon reviews for the product. When shopping for a family camping tent, we all look for a tent that we can trust. We want a tent that could be roomy enough, and reliable in harsher weather. Most tents found on the market are so substandard that purchasing them will be a gamble! How would it sound to camp with one of the best and most affordable tents on the market? WHO IS THE COLEMAN OCTAGON 98 FOR? The Coleman Octagon 98 is designed for any outdoor enthusiast looking to get the most out of your camping tent. Design – not only is this tent well-crafted, but it is also well-ventilated for the scorching summer. The fact that Coleman Octagon 98 being one of the best tents on the market lies in its durable construction. It features a full-coverage fly. The full-coverage fly is really versatile and drapes all the way to the ground. The compact design of the tent allows me to fit it in my car trunk easily. Construction – the D-door is really fantastic for easy entry and exit. You don’t need to zip or unzip the door unless you’re ready to sleep. We are worried about bugs and pests when we go camping. But, this tent features lots of interior meshing to ward off the bugs and pests. The hinged door only allows entry for the ones who hold the flaps up. So, you won’t have to worry about insects at all. The powdered steel framing is easy to construct and destruct. I really don’t have to struggle with pitching or dismantling the tent. Roomy – we are a family of 6. From time to time, we go out camping in the wilderness. When I purchased this tent, we took it camping to the mountains for the 4th of July weekend then. The tent was roomy enough to accommodate us all fully with room to spare. We had plenty of gear. Each door of the tent has two large mesh storage containers for storing our gear in. Weather Resistance – the first time I took it camping, we encountered sudden rainstorm at night. We woke up the next morning with 3 inches of snow. To our utter surprise, the tent didn’t leak one single drop! It sheltered us from the torrential rainfall and also from snow. Q: What’s a powdered steel frame? A: A powder-coated steel is effective in resisting rust and corrosion. Q: How well-ventilated is the tent? A: The tent works in conjunction with a D door, 2 door windows, mesh roof and fly vents to ensure ventilation. A: It weighs about 45.6 lbs. If you’re looking for a high-quality, well-built camping tent, then hardly are there any tents that could come close to the Coleman Octagon 98. It offers plenty of space, excellent ventilation, and incredible weather durability. I highly recommend the Coleman Octagon 98. If you want to learn more about Coleman Octagon 98, visit Amazon for more reviews! Do you love camping with your kith and kin? Are you looking for a high-quality family camping tent? Do you want a tent that could be roomy, easy to set up and reliable? When shopping for a family tent, we have to consider more factors than we do for a small tent. We want a family tent that could be strong, long-lasting and durable. Among other family tents, cabin-style tents are more popular among outdoor enthusiasts. WHO IS THE COLEMAN PRAIRIE BREEZE FOR? If you’re an individual looking for a high-quality family tent, then this is something you can easily depend on! Design – the Coleman Prairie Breeze features a roomy and comfortable living design in the wilderness. It can sleep up to 9 people with room to spare. On our first camping trip with the tent, we are able to fit in two queen size mattresses. And, it’s still plenty of room for our equipment and all of our bags! What I absolutely love about the tent is that it has a LED light and fan system built-in. After spending a strenuous day trekking, it was nice that we were able to cool off inside the tent. Performance – during the summertime, everyone remains worried about staying cool. We were too! But, the tent kept us cool and we were always comfortable inside it. Thanks to its integrated fan system and six oversized windows! Once you’re inside the tent at night, the tent has a LED lighting system that can deliver up to 75 lumens. Weather Resistance – much of the tent’s strength comes from its high-quality build. Its main fly seams are factory sealed. For a tent that comes from such a reputable company, it performed perfectly. Particularly when dealing with wind and rain, its performance is incredible! The welded seams will ensure that this tent withstands the harshest weather conditions like a windstorm. Q: How can I keep the cabin tent in good condition? A: Place a ground cloth or a tarp every time you set up the tent. Q: Is the rainfly detachable? A: Yes, the rainfly is detachable. Q: How long does it take to set up this tent? A: For expert campers, it shouldn’t take longer than 12 minutes. Not every cabin tent found on the market is reliable and high quality. But, the Coleman Prairie Breeze is not only a durable, high-quality cabin tent but also a standard that other cabin tents should aspire to! If you want to learn more about the Coleman Prairie Breeze, visit Amazon for more reviews! Do you want to get the most out of your family car camping tent? How would it sound to camp with a tent that is roomy, durable and nice to look at? When going on a car camping trip with the family, you have to take many factors into consideration. A family camping trip may include children, your distant relatives, friends and many others. The most important piece of gear you’ll pack is your tent. We all want a tent that is reliable and can offer protection and a place to call home! Today I’m going to introduce you to one such family tent that offers the ultimate livability. And, the tent I’m talking about is the Kodiak Canvas Flex-Blow 8-Person Tent. WHO IS THE KODIAK CANVAS TENT FOR? The Kodiak Canvas Tent is designed for any individuals looking for a family tent that is easy to set up, durable and spacious. Design – the Kodiak Canvas Tent features a strong build well-supported by its avant-garde design. To me, the thing that makes a tent what it is is its ability to stand tall. And, this tent really stands totally upright. Thanks to its Flex-Bow frame, which gives the tent its sturdy and taut feature. Not only does it stand upright, but it stands tall. Its ceiling height is a blessing for big guys like me. I’m almost 6’2″. And, it can fit in up to 6’6″ people easily. Two large, D-shaped doors offer easy entry and exit both through the back and the front. Interior – this tent has proved to be an ideal one for my family. As we tend to go out camping as a family. We needed a bigger tent. We are a family of 6. So, this 8-person tent can accommodate every one of us easily. Still, we have plenty of space to fit in our gear. Ease of Setup – many usually are worried about family tents because of their complicated setup. Yes, the setup can be a little confusing with the Kodiak Canvas Tent at first. But, once you set it up for a couple of times, you’ll be able to pitch it within 5 minutes. Just make sure tent is staked out well before trying to pitch it. Weather Resistance – the tent is indomitable in the event of strong winds. If you’re camping in a dry area where you may have to put up with sandstorms, then this is the tent you want. It resists water but is not completely waterproof. Q: How much does the tent weigh? A: The Kodiak Canvas Tent weighs about 84.6 lbs. Q: What kind of fabric is the tent made of? A: The tent is constructed with Hydra-Shield and cotton duck canvas. Q: How tall is the tent? The Kodiak Canvas Tent has its fair share of pros and cons. But, its pros will outweigh those little quirks. If you’re looking for a family tent that could be strong, durable and spacious, then this tent should be on the top of the pile. If you want to more about the Kodiak Canvas Tent, visit Amazon for more reviews! Are you planning a camping trip this summer? Are you looking for a tent suitable for family and group expeditions? Camping is a fun activity, that is best enjoyed with friends and family. When you’re camping with a family, that means you will have double-check your equipment from essentials to tent. You can pack essentials based on your needs. Even if you run out of things, you can stop by a Walmart. But, for the camping tent? It’s something you can change all of a sudden. You need a tent that is roomy, durable and sturdy. 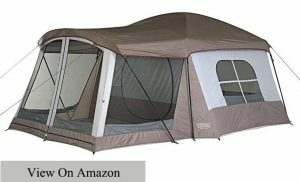 WHO IS THE OZARK TRAIL 10-PERSON XL CABIN TENT FOR? The cabin is designed for any individuals looking for a tent that could be suitable for a large group of people. I purchased this tent during the 2013 Christmas. Over the last four years, I’ve taken the tent camping 5 times. It supports my family really well! We’re able to fit three queen-sized air mattresses. Thanks to its 20 x 9 ft floor. Last summer we went to Grand Canyon for camping, it fit in a queen size bed on end. Since there were four kids traveling with us, we laid 2 twins on the other end for the kids. Still, the tent had plenty of room to spare, so we set up a 5′ table in the middle for keeping water bottles and fruits on. The ceiling height is long enough for a tall guy (6’2″) like me to stand up and roam the tent. The tent can be split into 3 separate rooms. You can be able to divide the tent with two removable room dividers. The room dividers aren’t of high quality. But, they can create a bit of privacy for you. The six windows offer increased ventilation, so you won’t have to worry about condensation. The door is small, so I have to duck a little to get in or get out. When we were camping at Grand Canyon, we had to put up with relentless rain for a day. But, the tent held up well. We haven’t gone through a heavy shower yet with the tent. But, I think it will put up perfect! Q: Is the tent waterproof? A: No, it’s not fully waterproof. But, it resists water. Q: Does it come with a stuff sack? A: The tent comes with a zippered carrying bag. A: Its shipping weight is 31.4 lbs. Whether the campground itself is the main attraction or the joy of going out on camping; camping exists in many people’s to-do list during summertime. The tent I have reviewed here is spacious, well-ventilated and well-constructed. Your family and you will live in total comfort in this tent! 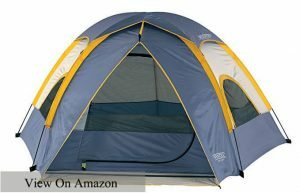 If you want to learn more about the Ozark Trail 10-Person XL Cabin Tent, visit Amazon for more reviews! Are you looking for a great tent for your SUV? Do you want an SUV tent that is roomy, versatile and durable? When shopping for an SUV tent, we tend to ask which one is the best. However, if the tent offers the perfect balance between price and quality, we settle for it. 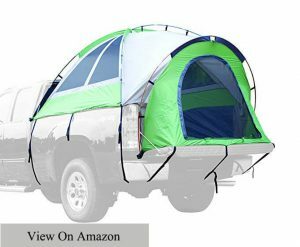 SUV tents are becoming more and more popular every day. Simply because they offer more comfort than conventional models do. WHO IS THE SPORTZ SUV TENT FOR? The SUV tent is designed for any individuals looking for an affordable tent without sacrificing quality. Roomy – we are a family of 6; three kids and my partner and I. We needed an SUV tent so that we could camp at Lake George, New York. And, this tent accommodated us fully with plenty of room to spare. My wife and I first pitched the tent without attaching it to the SUV. However, we did attach it to our SUV the next night. It has a 7′ x 6′ footprint size, which we used to store our equipment. The tent is a blessing for me. Since I’m a tall guy (6’2″) and I needed a tent, which could allow me to stand up without feeling cramped. And, this tent with 7′ of headroom worked wonders for me. Construction – the tent is erected by steel and fiberglass poles. As a result, the combined effort of the two, we had a pretty stable tent against strong winds. The steel and fiberglass pole structure is also useful for an easy 1-person setup. Although my wife and I initially had to set it, now I can alone set it up. The tent comes with peg loops on each corner, therefore I was able to secure it to the ground. Like most other SUV tents, this tent also has an adjustable sleeve that you can attach to the vehicle. Q: Who manufactured the product? A: It weighs about 48 lbs. A: Product Dimensions: 32 inches x 14 inches x 14 inches. If you’re into camping, then you probably looked for a quality SUV tent. And, the SUV tent that is really one of the best on the market is the Sportz SUV Tent. It offers ample interior space and ample headroom. It is easy to set up and withstands strong winds. It really should be your top choice when it comes to purchasing an SUV tent. 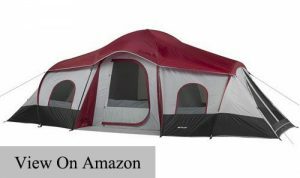 If you want to learn more about the Sportz SUV Tent, visit Amazon for more reviews! Weather, precipitations can be a vital factor for upgrading to a luxury camping model or a different model. It’s good to remember that weather can get pretty harsh in the summer. Look for a tent with robust pole materials and designs. Seam sealing and waterproof fabrics must be improved in quality. Full-coverage rainfly is a must. It will help resist blowing rain. For most 3-season trips, any tent from my list should put up well. Simply withstanding wind or rain is not all about weather resistance. The hot summer months can get blazing. A muggy and hot tent can be just as dilapidated as a rain-soaked tent. For a tent to put up well with the hot condition, it needs to ventilate well. Therefore, look for a tent that features healthy swaths of mesh. Mesh can increase airflow and reduce condensation. A tent’s capability to withstand a storm is directly tied with rainfly. The amount of coverage a rainfly provides is vital to handle a storm. If you’re preparing for camping in 3-season conditions, it’s good to get a full-coverage rainfly. A partial-coverage rainfly can botch your tent if rain comes sideways. If you are a tall person or want to be able to stand up when changing clothes or just want to roam around the tent without feeling crammed, then look for a tent with a high peak length. If you’re camping with 4+ people, then having 2 doors becomes a must. Your tent mates wouldn’t like you crawling and stumbling in the middle of the night. You should take door size into consideration too. Big doors will allow easy entry and exit. A full-coverage rainfly that shelters the door(s) of a tent is referred to as a vestibule. It creates a space in front of the door(s). Tent vestibules look like mushrooms at the front of a tent. You can utilize the space it creates for storing gear away from rain and reserving your shoes. A vestibule is a necessity if you don’t have a car nearby. Pockets and interior partitions form the interior of a tent. Since you’re spending a couple of days camping, there isn’t a real necessity for having interior too fancy. A pocket can come handy for stowing a-headlamp or your medicine or something you may need nearby in the hand. A divider can partition the tent into separate rooms and provide privacy for adults if there are children. A footprint works as an extra layer that protects the tent’s floor. A footprint is positioned under a tent that prevents the wear and tear of your tent. If you’re camping on desert sand or near a lake, the bottom of your tent is likely to experience rustling and wear and tear. A footprint can prevent such an outcome and extend the lifespan of your tent. Having a footprint specially designed for your tent will accommodate your tent’s shape exactly. It’s far better than a generic ground cloth that is likely to catch water or moisture. Water caught may seep through the floor fabric and damage your tent. So, don’t forget to order a footprint.